Since this post was created, the tragic events in Boston have taken place. It is always a shock to come face to face with evil in one's own corner. Though the Note Card Party continues, I know that thoughts and prayers are with those who are suffering whether in grief over lives lost or with grief over the challenging task of recovery. 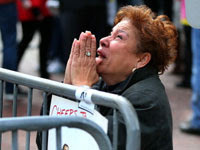 When I saw this picture on MSN of a woman praying, I thought that her anguish says it all and that her example is fitting. Such events take us to our knees. Spring flowers are important. I am in need of spring flowers. Since there are none here yet, I shall have them this way. I had fun with adding greetings, too, as so many of you have tried. Beautiful! I just picked some daffodils today before more heavy rain was expected. They do not like heavy rain. A very sad day for us all! Your lovely flower pictures have brightened my day. The greetings on the note cards are very nice as are the flowers! I am needing flowers too. I didn't get a post ready for note cards this month. Will try for next month. Such pretty flowers - love love love this time of the year. Lovely note card photos, Vee, whether this year or otherwise. I like the greetings you've placed on each one. Let's savour the beauty in the world. Indeed, prayers for all those involved or affected by the terrible occurrence in Boston. Isn't it nice that we produce spring flowers to enjoy before they're actually blooming outside. Love the watering can note card Vee. I'll have to try sentiments on mine next month. Hi Vee....for me, Roses are a spring flower....so I joined in the party!! Thank you for hosting! The flowers are lovely, especially with the captions. I like this special touch. 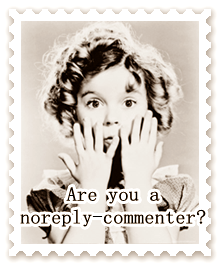 I quoted you in my post today. I wasn't sure what to say and I thought you summed it up better than I could have. Please let me know if that is OK with you! Sweet hugs my friend! Hi Vee, we all need some spring cheer today. Lovely spring images. Thank you for hosting today, this tragic event dulls my heart. 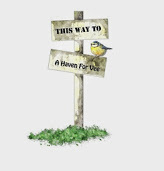 Your beautiful cards of spring flowers have an added poignancy today. Sending love, hugs and prayers to all my friends in the US. Like you, Vee, i can only turn to prayer although it is becoming harder and harder to understand today's world and how things like this can possibly happen. Thank you for sharing your Spring flowers! Your pretty spring flowers are indeed what we need today. The tragedy in Boston is so very sad and impossible to understand. Hey Vee I joining this fun "note card" party and I'm also your newest follower and I've put your blog on my sidebar. I had so much fun with this theme.....an uplifting day of creating art after the tragedy of yesterday. Have a wonderful week, Vee. Thank you for reminding us to pray for the victims of the Boston Marathon. My prayers, combine with yours, dear friend!!! 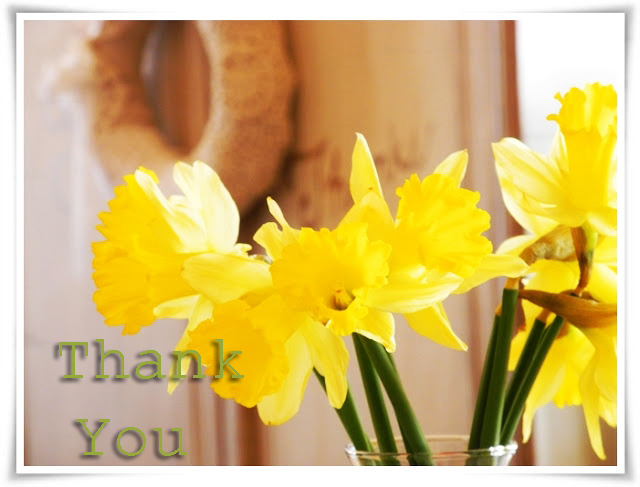 Thank you for hosting Note Card Party...my first entries share a portion of your blog name!!! Oh those cards make me have a good feeling in my heart. Spring is coming. Sadness, however, due to the drama in Boston. Our town had 10 people up there. All a safe and home now. Cheerful flowers for a solemn week. Thanks for posting them and hosting, and I like how you added the "sentiments" on your cards. Our friends' son ran in the race and had a really good time so was done before the bombing; but it was a tense couple of hours until we knew he was safe. Beautiful. I must check and see if I can share some Spring flowers, too. Time will tell. Thank ya, ma'am, for hosting this fun party. I know what you mean about longing for Spring's Flowers - I'm starting to see promising signs these last couple of days! Your picture of the lady praying in Boston says it all!! So, so horrific! I feel so sad for Boston and for those families that are going to go through this time of grief. It is not very far removed for you...and so I"m sorry for you too. Gorgeous Vee!! Sending you hugs! A lovely post Vee. I just feel so sorry for the families and all the injured in Boston. When I saw that image on TV last night I thought of all the people praying, just like that woman. It's the only way we'll overcome such evil. There's nothing like flowers to brighten a day! The sadness from your part of the world has touched us all in some way. Two guys from our neighbourhood were there...one running...one cheering. They were not hurt...but were caught in the middle of all the chaos. We just never know what tomorrow may hold! This tragedy really shook me up, Vee. I have been praying for Boston and for those innocent lives lost and those injured. Flowers are a healing balm and I also turned to them for comfort. There is such love and beauty in the world --we have to keep thinking of that! Your springtime flowers are so pretty! It will be awhile until I see nay here --more snow coming our way! Your flower note cards are so pretty, Vee. Thank you for cheering us up by going ahead with the party. First, I have to say that I love that shot of the woman praying. What a horrible, horrible thing evil has visited on us yet again. I love your spring flower shots. My favorite one of all is the forsythia in the watering can. I just flat out love that! I'm not joining this month (sigh). I figured if I could just get the ability to post something in my world, it ought to at least be something new. Frustrated. 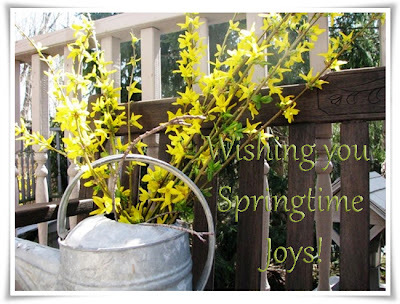 BTW, here's a dumb cluck comment: Until this post, I didn't know it was FORSYTHIA. I thought it was "forsynthia". You know, like it was for a girl named Cynthia but misspelled. We were thinking in the same vein, Vee! Your photos are beautiful! I'm sure that you are more than ready to see some cheerful blooms. I find that as the world goes mad I am ever happier here in the country,peace and tranquility all around me and an on/off switch on the horrors of the world being brought to us by Proctor and Gamble and Johnson and Johnson...I grow weary of hours and hours of rebroadcasts of tragedies that only embolden our enemies to do bigger and worse things...my heart heals in the garden where I talk to the Lord...and ask why. yes, we need such beauty, especially at a time like this. yes. yes. yes. Beautiful pictures. I like how you added the text to the photos. 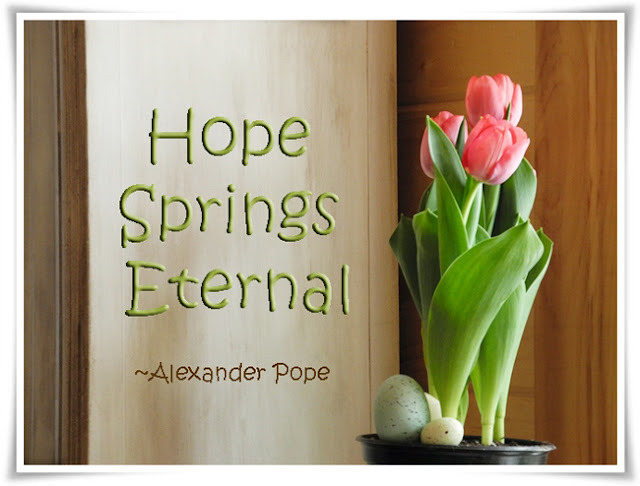 I especially like the tulips and their message of hope! My first time sharing. I love this meme. Looking forward to viewing everyone's cards. Your flowers are gorgeous! We don't have any here yet either. Your flowers are awesome Vee - you've captured their freshness and colours beautifully! I love your post cards and the sentiments. 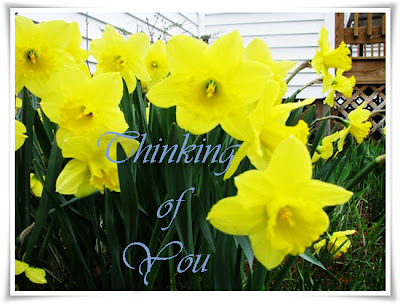 I will have to try that next time :) Daffodils are my favorite spring flower. I feel the same about the tragedy in Boston. That is a very moving picture and it brings me to my knees too. Thank you so much for hosting. Our hearts go out to Boston. Sending many prayers and good wishes to each and everyone. Such a senseless tragedy. Your post cards are very beautiful. I am now a follower. I found you through Pamela's blog, Playing with my Camera. Thank you for your beautiful heart. I just visited you and didn't find a link to the Note Card Party. Having just closed the party, I hope that you will join in next month. The party will be on the 15th of May. Beautiful notecards, Vee. I think my favorite is the third one for its simplicity and I love the quote. The flowers are such a feast for our weary and sad eyes right now. My heart and prayers go out to everyone in Boston and West, Tx. I'm absolutely loving all the entrants I've seen for this meme and am going to try to remember to join up next month (if it's OK).